The Coventry Engineering Rotary Coolant Adaptor range gives users a cost effective system that allows machines without through spindle coolant the ability to utilize modern through coolant cutting tools. 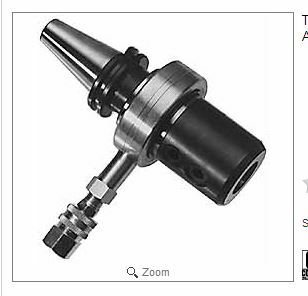 These adapters are designed for both CNC machines with automatic tool change or for machines with manual clamping systems. The addition of a simple coolant feed block mounted on the machine head is all that is required to use the system. Specials are available to give modular front ends (ie HSK) to utilize existing toolholding systems.